Just when you thought you had settled on your preferred news magazine for the iPad (be it Flipboard, Zite, Currents, or something else entirely), another new contender enters the ring. Today, the NewzSocial app is launching its own version of a social news magazine for iPad, but is offering a different take in order to stand out from the rest. In other magazines, you subscribe to read news from various sources (blogs, newspapers, online magazines, Twitter, Facebook, etc.) or you can pick from an editorially selected bundle of sources (like Flipboard offers with its sections on “Home,” “Travel,” “Photography,” “Tech,” etc.). 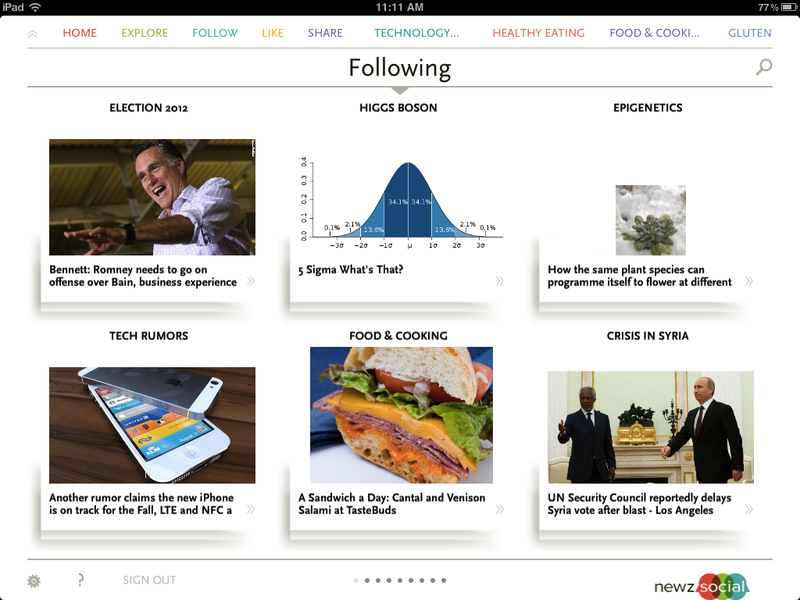 But in NewzSocial, you, the reader, curate your own sections which can be as broad (healthy eating) or as narrow (Gluten-free recipes) as you want. And you can collaborate on these sections with friends. Let’s back up a minute before getting into what NewzSocial does. Personalized news magazines that simply let you build your own sections have been done before. Remember Evri? Feedly’s recent redesign? Sobees? Scoop.it? This has been a crowded space, with a number of startups looking to gain traction. So what else, besides personalization in and of itself, makes NewzSocial unique? Those collaboratively designed channels can also be shared to social networks – not an article itself, but the entire channel of news. In other words, it’s not just about personalization of content for your own benefit, it’s about becoming your own editor for an audience. At the end of the day, though, it comes down to execution. NewzSocial has a different user interface where sections appear like stacks that, when tapped, expand into the full news magazine experience. 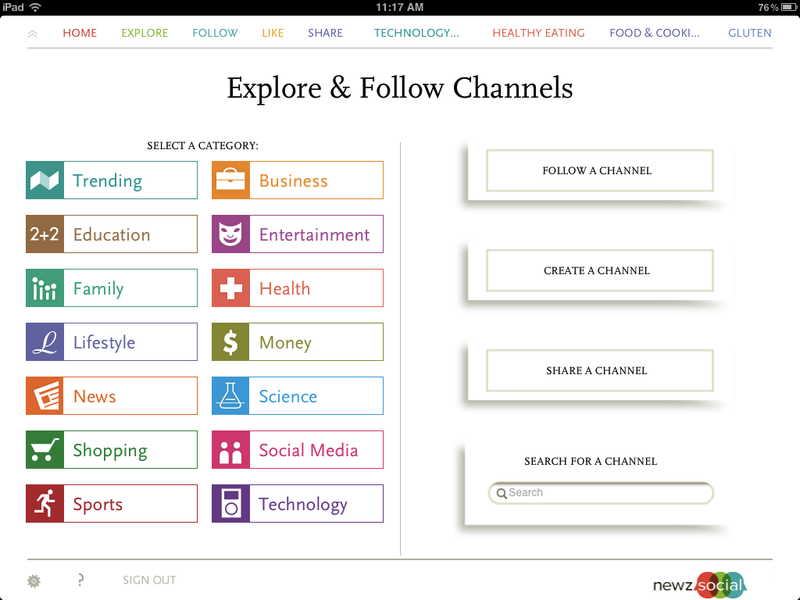 It has different ways of creating, organizing, searching and navigating through content. It has its own selection of pre-bundled channels to subscribe to. Whether or not you prefer how it works ultimately comes down to personal choice. Jagannathan says the company’s plan is to offer this same solution to businesses, allowing them to create their own curated magazine for their customers, employees, partners, etc. In that product, NewzSocial will offer a private business network, private channels, automated tweets and curated content integrated into their website. Frankly, that sounds like the more intriguing use case than the consumer-facing product, but maybe I’m just in news magazine overload mode here. NewzSocial is being bootstrapped by Jagannathan and includes a team of a few others from Responsys, including employee #7 Shastri Purushotma. You can download it here in iTunes.